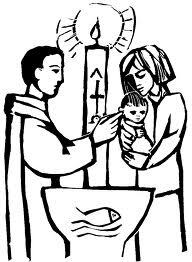 The Sacrament of Baptism is the first of the three sacraments of initiation. It is also the first of the seven sacraments in the Roman Catholic Church and welcomes the baptized into the Church, the Mystical Body of Christ on earth. Baptism is the basis of the whole Christian life, the gateway to life in the Spirit and the door which gives access to the other sacraments. Through Baptism we are freed from sin and reborn as children of God; we become members of Christ, are incorporated into the Church and made sharers in her mission. Baptism is the sacrament through which we become part of the family of God. Christ the King welcomes those who wish to be baptised. The “source and summit” of the Church’s life, the Eucharist makes present the body and blood of Christ. Through the words of the priest at Mass, the bread and wine are transformed into Christ’s body and blood. This is known as transubstantiation (i.e. a change of substance while the accidents or appearance remain the same). In the Eucharist, Jesus Christ is truly, substantially and really present and the bread and wine have ceased to exist. The fact of his being there is known as the Real Presence. 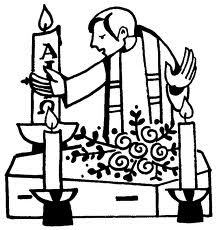 At Holy Communion, one receives the body of Christ in its entirety. Confirmation strengthens (“confirms”) the baptised soul. 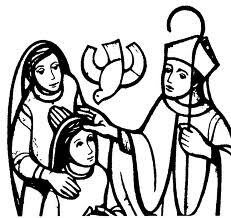 The bishop lays his hands on the one who is to be confirmed and pronounces the solemn words, “Be sealed with the gift of the Holy Spirit”, anointing the forehead at the same time with the oil of chrism. Confirmation confers a particular grace, fortifying the soul to bear a greater witness to the faith than before (cfr Acts 1,8). At Confirmation, which usually takes place during Mass at or around the feast of Pentecost (the commemoration of the Holy Spirit’s descent on Our Lady and the apostles), it is customary to pray for the gifts of the Holy Spirit: wisdom, understanding, knowledge,counsel, piety, fortitude and fear of the Lord. Reconciliation (also called Confession or the Sacrament of Forgiveness) is the sacrament in which the sinner receives complete forgiveness from God for his or her sins through the words of the priest (absolution). Today many people would seem to be put off by the sacrament of reconciliation. But it is a wonderful means to receive God’s grace – the assurance of his presence and continuous mercy for us and the strength to continue on the paths of holiness. There is no need to be fearful of this great sacrament, for in it a special encounter takes place that heals the soul of all past wrongs. 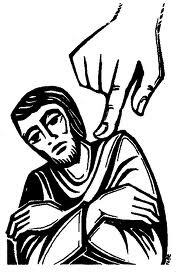 Why confess sins to a priest? It is quite possible of course to pray in sorrow to God “directly” for one’s sins. Indeed this is necessary, because it fosters an attitude of compunction, or the revulsion of one’s past deeds. Yet such prayer, even if said alone, always takes place in the context of the Church, the mystical body of Christ, since it is in and through the Church that Christ communicates with us. And Our Lord also instituted the sacraments for the Church to show just how close he is. As signs that bring us his actual presence among us, his saving grace, they are the means he gave to the Church for her members to become partakers in the divine life. As a minister of the Church, the priest is a mediator between God and his people, administering sacramental grace through the sacraments. This is sanctifying grace, that “fits us for heaven”, as the carol “Away in a manger” puts it. There are four key moments in the sacrament of reconciliation: Contrition (sorrow for sins) Confession (an honest and straightforward account of sins committed since one’s last confession) Absolution (the prayer given by the priest, which absolves (forgives) the penitent of sins confessed) Satisfaction (penance – as a means of restoring the justice owed to God that is lost through sin; it usually takes the form of prayer or an act of reparation). What needs to be confessed? All mortal sins committed since one’s last confession must be confessed. A mortal sin is a sin that gravely offends against God. It is also good to confess venial sins, which might be considered less serious, but which still stain the soul. Here is an examination of conscience that might act as an aid to preparing yourself for this sacrament. 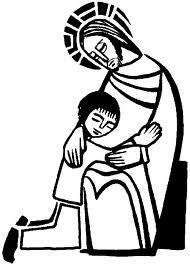 Have great confidence in the sacrament of reconciliation, especially if you have not been for a while. You will receive great encouragement from the priest, who is always happy to hear your confession. The Anointing of the Sick arises from Christ’s ministry as a healer, which is handed on to the apostles (Mark 6,13). It can take place as part of a liturgical service in Church with a number of people; it can also be in private with someone who is unwell or preparing for surgery; and it can be in an emergency when someone is dying. This is a sacrament of healing and its power should never be underestimated. In all cases the Word of God is proclaimed to provide hope and consolation. In an emergency or when someone is able to make a confession the priest will give absolution and the Apostolic Pardon. 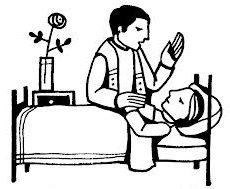 The priest then silently prays over the sick person resting his hands on their head invoking the Holy Spirit. After this prayerful silence the priest, using the oil of the sick, anoints the forehead of the sick person with these words: “Through this Holy anointing may the Lord in his love mercy help you with the grace of the Holy Spirit”. He then anoints the palms of the sick person’s hands with these words: “May the Lord who frees you from sin, save you and raise you up”. 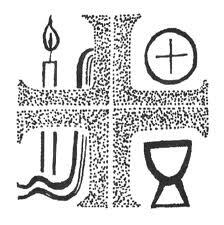 Arrangements exist for Holy Communion to be taken to the sick and housebound, with either continuing or temporary needs. This normally takes place after the Sunday Mass, but arrangements can be made through the parish priest for Holy Communion to be taken on any day of the week to suit those who are ill or housebound. Christian marriage is a free, lifelong and natural union between a man and a woman. Christ has “raised marriage to a sacrament” (CCC 1660). In it, he is present in a particularly powerful way as the couple express their consent to each other. The sacrament has become a “living sign” of the union between Christ and his Church (cfr Ephesians 5,21-33). Just as Christ is united to the Church, so, through their consent, are a couple united in a permanent and exclusive way to one another. Marriage can take place as part of a Mass (known as a Nuptial Mass) or as a service in its own right. The groom, best man and other guests gather in Church and when the bride arrives she is escorted down the aisle usually by her father, maid of honour and bridesmaids with some accompanying music. 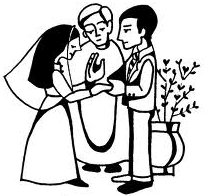 At the beginning of the ceremony everyone is welcomed and the beautiful opening prayer concentrates – as all the prayers of the Mass or service do – on the couple: Father, you have made the bond of marriage a holy mystery, a symbol of Christ’s love for his Church. Hear our prayers for N. and N. With faith in you and in each other they pledge their love today. May their lives always bear witness to the reality of that love. Throughout the ceremony we are praying that the couple will be a reflection of Christ’s love for his bride the Church. We listen to the Word of God which will reflect on what is about to take place. Then the priest or deacon will give a homily about marriage. We then move into the Rite of Marriage. First the couple must declare that there is no legal barrier to their union, and that their intention is lifelong and open to the possibility of children. The couple then give their public consent to becoming husband and wife. They will then ask all present to witness their intention to be faithful for life regardless of circumstance. During this they hold each other’s right hand. The priest then asks for this consent to be blessed. As a symbol of what has happened between the two they exchange blessed rings. After the rite of marriage there are bidding prayers and the signing of a civil register to meet the requirements of the law. There follows the Eucharistic Prayer, in the case of a nuptial Mass. It is particularly appropriate, since, as we noted above, a marriage mirrors Christ’s love for the Church. The Eucharist, in which Christ is present, thus carries with it a significance that suggests how the couple can remain in love with each other if they remain in love with Christ, who unites them both. The nuptial blessing, a solemn prayer proclaimed by the minister after the Our Father, echoes these themes. At the end of the service the new husband and wife process out of Church together followed by their witnesses, family and friends. Ordination takes place within a Mass and is presided over by a bishop who ordains. The Word of God is proclaimed. After this the candidate for ordination is formerly presented to the Bishop usually by a member of staff from the seminary responsible for his formation, then a homily follows. During the right of ordination we invoke the prayers of the saints and then the bishop lays hands silently over the candidate, other priests present do this too, after which the bishop prays over the man. When this prayer has been said, the man is a priest. He is then vested in a stole and chasuble sometimes by family or friends, his hands are then anointed with chrism and he is handed the chalice and patten as signs of his ministry at the altar. After this he is embraced in the kiss of peace by the bishop and then all priests present as a sign of brotherhood. The new priest then joins his brothers in the priesthood for the rest of the Mass. Every year first communions celebrations take place together for all first communion candidates in the parish (usually year 3 upwards) and usually occur during June. A regular, organised preparation in a Catholic school or parish is essential prior to first forgiveness and first communion. Please inform the parish priest immediately on the passing away of a family member. In consultation with the Funeral director, funeral arrangements are made at the convenience of the family and the availability of the church and priest. The funeral service is planned always in consultation with the priest and the Christian nature of the service should always be maintained. The RCIA is a communal process and involves a number of stages punctuated by liturgical rites to aid and assist the potential convert toward the final rite, usually at the Easter Vigil at which time they will become full members of the Roman Catholic Church.